Heavy Duty Pressure Regulator 25 psi, can withstand 70 psi incoming presure. 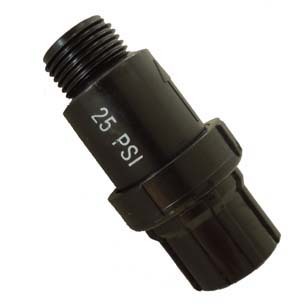 25 psi of pressure is great for drip, and soaker hose systems. This item can not be left under pressure and should be used after a timer. Use above or below ground, can withstand severe water hammer. Female Hose Thread x Male Hose Thread. Tip: If you know you have high water pressure consider #650 adjustable pressure regulator, with gauge that works up to 160 psi. This is actually the same regulator they use in RV's for extreme pressure.